Frederick William Watts' early years have always been something of a mystery. It is thought that he was born in Bath, 7th October 1800 and baptised the following year in St. Albans as William Watts. It is most probable he enrolled in the RA Schools in 1817 as William Watts subsequently changing his name to Frederick William Watts to avoid confusion with the landscape painter, William Watts (1752-1851). He was awarded Silver Medals at the RA School 1819-1821 and exhibited at the London Royal Academy from 1821 until 1862. Watts also exhibited at the British Institution, Suffolk Street Galleries and at the New Watercolour Society. 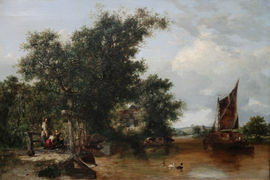 Watts lived in Hampstead from 1821, where John Constable (1776-1837) also lived, and, some twenty-five years older, was to have a marked influence on Watts’s style. Although it is not known that they ever met, Watts would undoubtedly have been familiar with his work and Hampstead was a relatively small town. 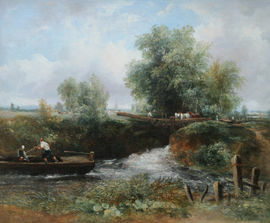 Watts painted landscapes throughout England and Wales, visiting north and south Wales, Derbyshire, Devon, Isle of Wight, Sussex and, of course, Suffolk and Essex. He painted many views around what is now north London and Middlesex and views on the Thames. 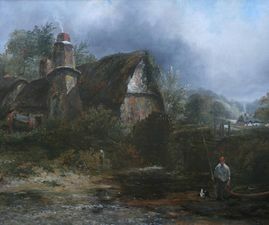 Watts was highly successful in his portrayal of the English landscape and widely collected in his lifetime and throughout the twentieth century in Britain, Europe and North America. His work can be found in: London, Victoria and Albert Museum and The Tate.